If for this Christmas Holidays, you’re planning to Decorate your Bedroom, then Best Quality Bedding Set is the good idea to Decorate your Bedroom Decor. Here on this Online Site-Ease Bedding, you can find Silver Quilts and Bedding Sets within the Budget. So take your time to choose the Best Bedding, which can fit within your Budget and match to your Room Decor!! Modern Coverlets and Quilts to Buy Online! This lightweight quilted blanket is great for keeping cool during the warm summer nights. Suitable for cool Winter nights as it gives you comfort by adding attractive texture and depth to your bedroom with the versatility of a solid color. The classic stitch will go with any decor. This Quilt will certainly add a whole new decorative element to your bedroom. Luxury Comforter Set features technique style pleating on this designer looking bedding set. In addition with fashionable Decor Pillow and Shams creating elegant bliss. Front of Comforter and pillow shams made of mat satin fabric, back of comforter and pillow shams made of msgs microfiber. Decorative pillow made of mat satin fabric to match. One Comforter, Two Pillow shams, One Bed skirt, One Decorative pillow Style. The Soho quilt and shams feature a variety of the latest fashion colors and themes printed in stripes on an ivory ground. Geometric and stylized lace motifs provide a genuine metro/urban appeal in Silver, Black and corn silk. Each set includes One quilt and Two pillow shams (One sham per Twin set). Immerse yourself in the softness of Natural Comfort with our luxury microfiber quilted Bedding Set, guaranteed to keep you snug in its year-round plush-filled weight! 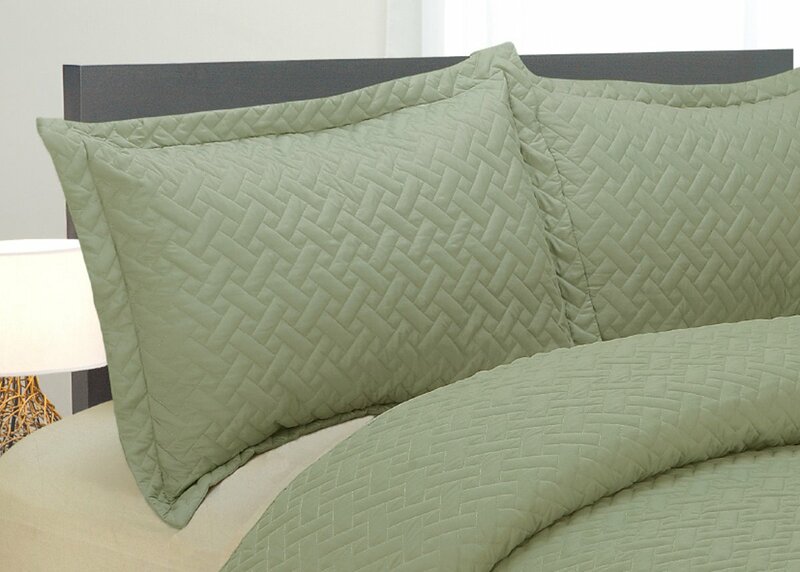 The chic quilted texture creates a sophisticated appeal to your bed with specially mercerized microfiber fabric dyed with the latest fashionable fall colors. 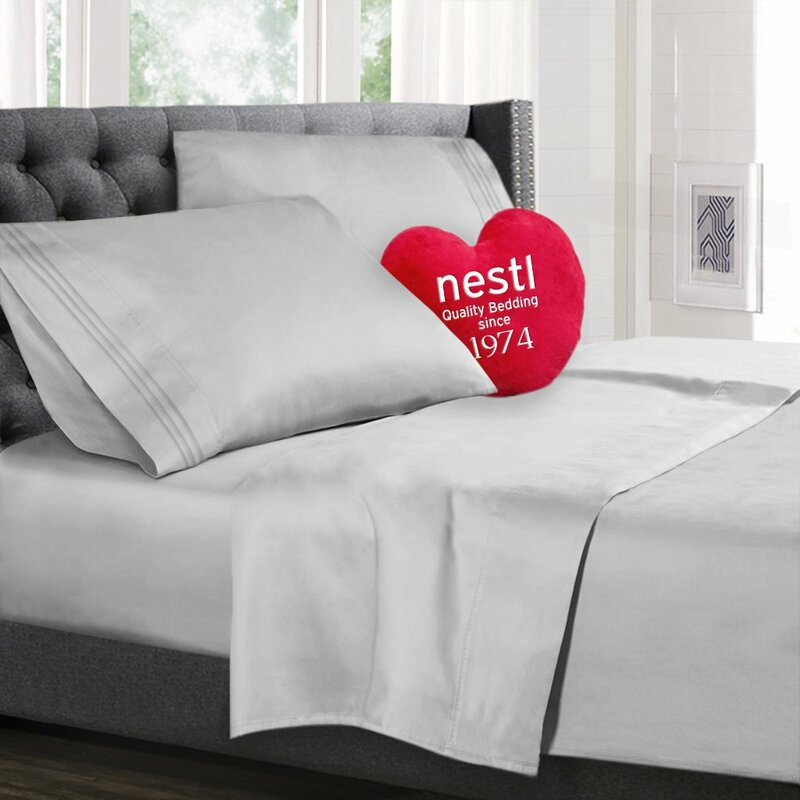 Made of 100% Cotton, the Sydney Duvet Cover Set is the perfect addition or update to your Bedroom design. With a subtle design and soothing Silver and Mint color palette, it is both pleasing to look at and feel as you drift off into sleep. New Year is just around the corner, this cute Bedspread is reminisce of the New York New Year Ball. 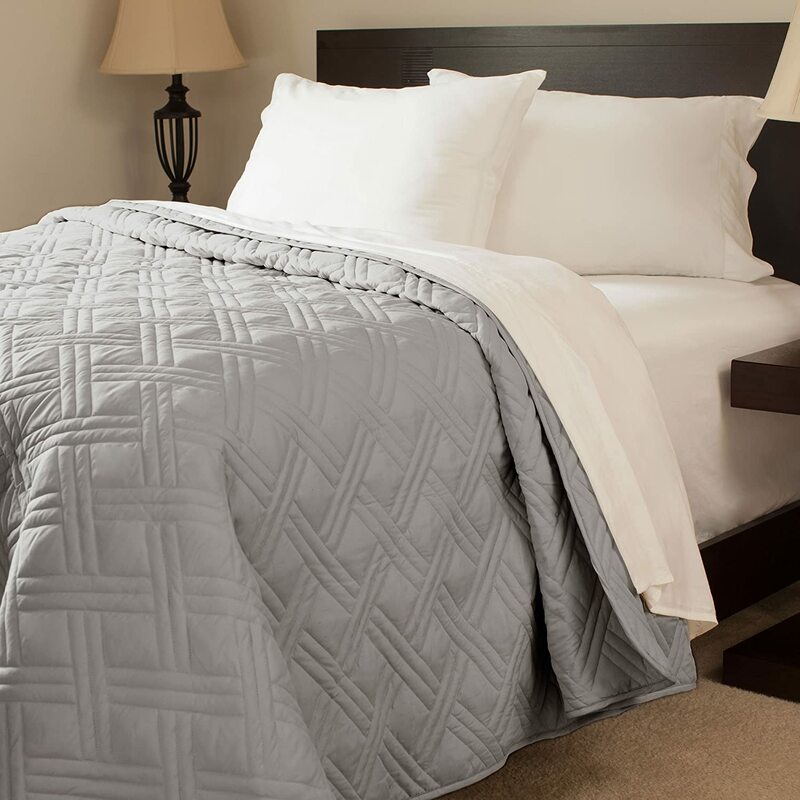 Intricate Stitch work give the quilt a textured feel while keeping you warm and soft. Modernize Your room with this silver Bedspread. It’s light weight makes it a very convenient and affordable alternative to more heavy quilts and Comforters Sets. Visit your favorite coffee spot in town with our Mocha Latte bed set. With Caramel faux satin you will be swimming in your favorite drink in no time. Impress your Guests,Family and Friends with this Regal Comforter Set. Palermo 3 Piece Quilt Set transforms your bed in this luxurious Chevron pattern Quilt Set. Elegant and durable high quality fabric in a Chevron quilting pattern that is a great way to add simple luxury to any guest or master suite. Enjoy this quilt with the beautiful coordinating set of shams. Featuring Sicily… a masterful way of featuring a traditional scroll jacquard motif on one side and it reverses into a contemporary Houndstooth pattern. All you need to do is pick your mood. flip the Quilt and Viola 2 completely different looks in one. We knew you would like that enjoy luxury modern and trendy decor pillows with decorative embroidery accents to coordinate with any look, in silver. Luxury Duvet Cover Set Romantica features technique style pleating on this designer looking Bedding Set. 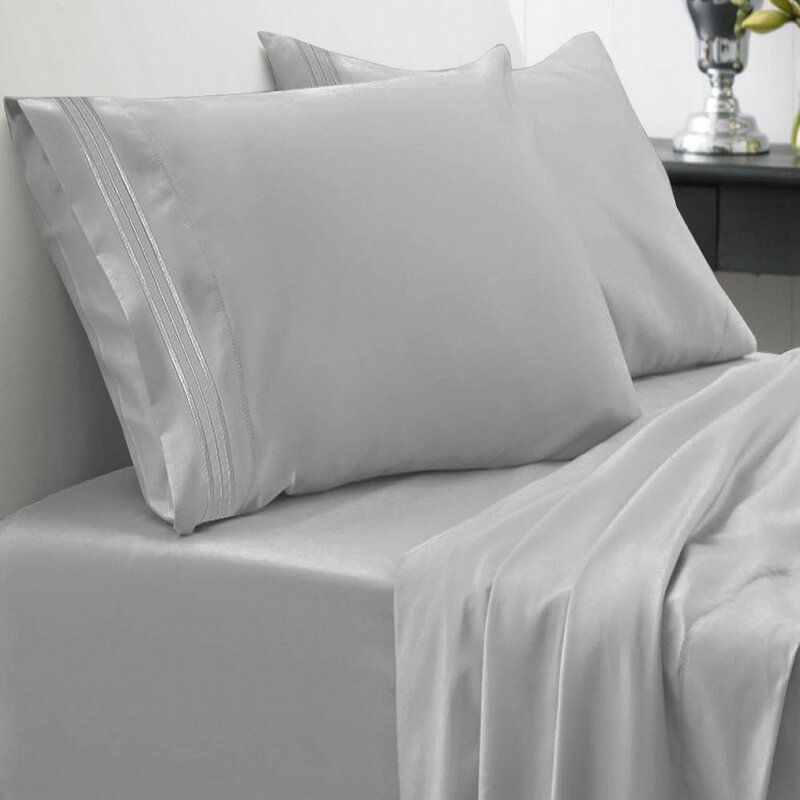 Front of Duvet Cover and pillow shams made of mat satin fabric, back of duvet cover and pillow shams made of microfiber. Set Includes: One Duvet cover, Two Pillow shams, One Decorative pillow. 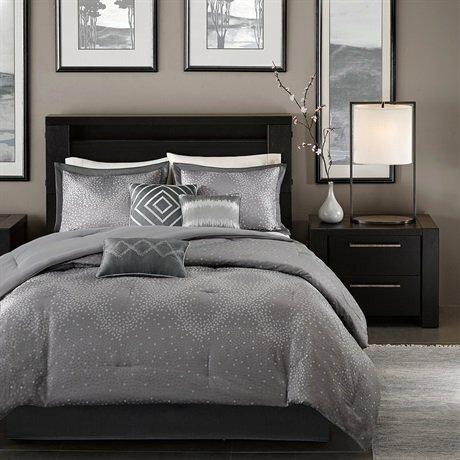 Elegant solid quilt set with Gray tones, will surely add warmth and beauty to your bedroom. This gray and silver set shimmers with excitement in patterns of woven geometric circles that complement contemporary decor. One Comforter, Bed skirt, Two Shams, One Tri-Pillow pack, Two Euro covers and Two Euro pillow. Finish your bedroom design in one swift stroke with this striking Amaysia bed set. Featuring a beautiful Silver and Black Floral design and containing everything you will need for a first class bed, you can’t go wrong with this bed set. Care Instructions: Machine wash cold on gentle cycle. Do not bleach or dry clean. Tumble dry low. Light iron as needed. The exquisite and high-quality products will definitely add taste and charming to your bedroom. What you choose here is not only a Bedding collection, but also every night’s sweet dream and what way of life you want to live. Beautiful Silver Comforter Sets for Sale! To update your space to a modern look, try the Madison Park Biloxi Collection. Made from polyester jacquard, this unique design is woven to look like sequins. One Comforter, Two King Shams, One Bed Skirt and Three Decorative Pillows. 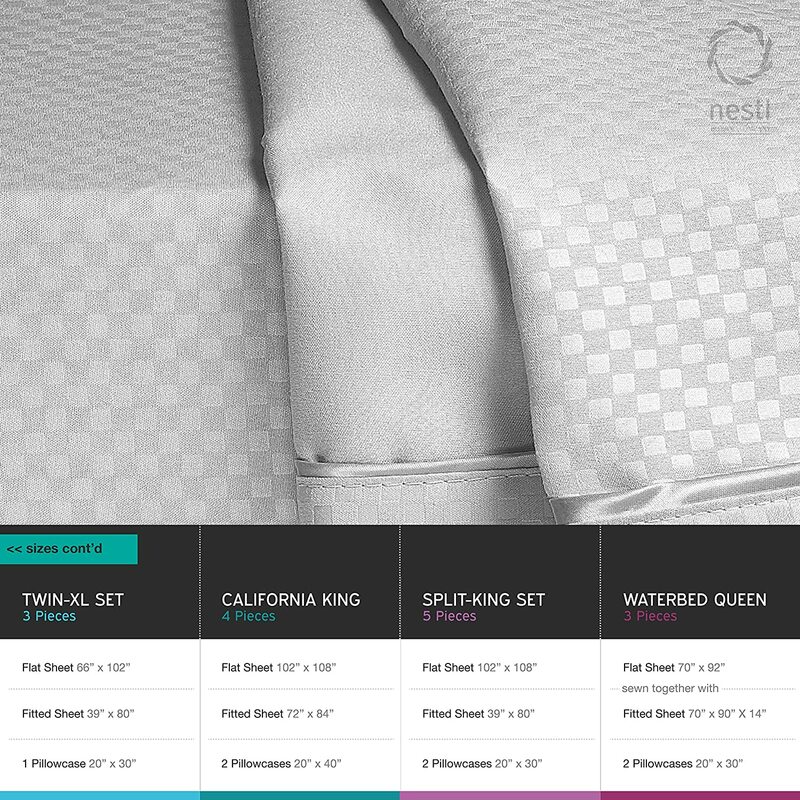 Look for Complete: Madison Park Bedding Sets! Stay clean is the most amazing comforter you will ever experience. Made via nanotechnology, Stay clean resists water and stains while retaining 100% of the natural feel of the fabric. Unlike other comforters, Stay clean protects against spills of all types. Stay clean is not a coating and will not wash out, so the product is long lasting. 100% microfiber cover and super soft polyester down alternative fiber fill. One Comforter and Two shams ( 1 with Twin). Complete 24 Pcs Bedding Ensemble that offers you Two unique and different looks in one set as if you have two not only one!! Looking for a bedroom ensemble that has everything? One side is a stunning Jacobean print while the other side offers ruffled and pleated hand technique. This comforter set, sheet set, Decorative pillows and window treatments all match and are all included in this super set. Enjoy luxury embroidery trims in a color blocking theme that is sure to decorate your entire master suite or guest Bedroom in one purchase. For a modern twist to sequins, the Madison Park Quinn comforter set uses a woven jacquard fabrication that appears like different colored sequins cover the top of bed in a zigzag pattern. Three decorative pillows use creative embroidery techniques to bring the top of bed pattern and zigzag patterns throughout this collection. The design has an ombre effect looking heavy in the center of the bed and spreading out towards the top and bottom of the comforter. Two matching shams share this ombre design. The Jupiter Quilt Collection concept is an inspiring abstract design concept which is very detailed and is actually finished by hand. Inspired by handcrafted details to craft a rosebud applique which is very life like to create an abstract Floral look. Enjoy super soft microfiber fabric for a soft touch and feel. It is very beautiful and has so many colors to choose from them!! Egyptian Quality – Brand New and Factory Sealed No Ironing Necessary. Comfortable quilt, Luxurious design within Affordable Price!! Unlike other comforters, Stay clean protects against spills of all types as you can see in the above Picture. Stay clean is not a coating and will not wash out, so the product is long lasting for years to come. Beautiful luxurious checkerboard embossed design, this set will update the look and feel of your bedroom like an upscale 5 star luxury hotel. You can enjoy your sleep and wake up happy each morning. 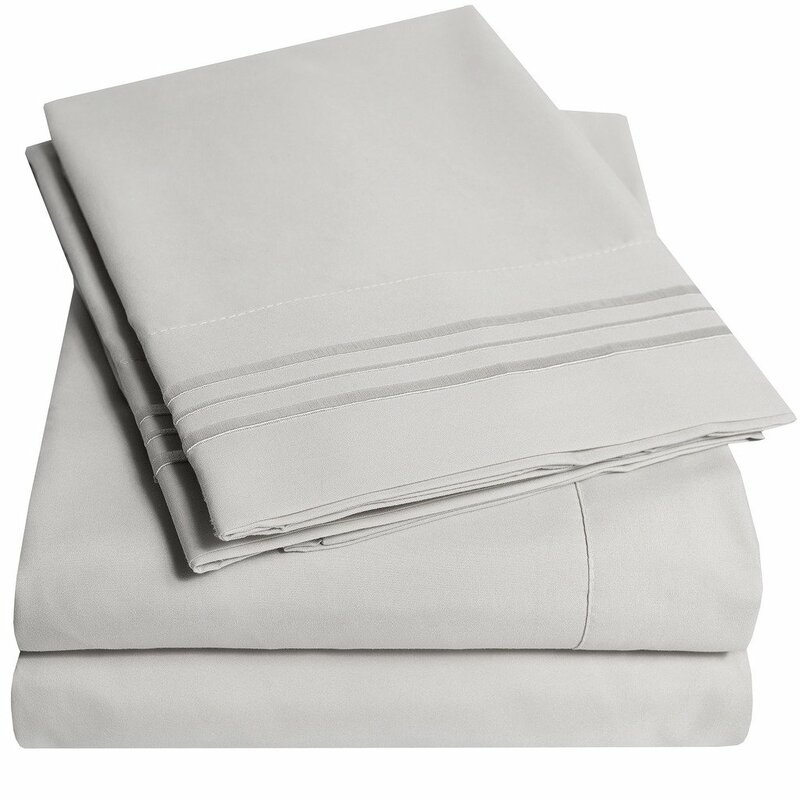 The ultimate best choice and most comfortable Bedding set on amazon, more than a basic sheet set this bed set is beautiful, silky soft, luxury and smooth creating the most soothing and relaxing sleeping experience. So many Colors and Sizes available to choose from them according to your Room theme!! Comforter, Two pillow shams, Two euro shams, Two decorative cushions and One bed skirt. So many Colors available to choose from them!! The Madison Park Iris comforter set gives an elegant look to your bedroom decor. A silver Crinkle fabric is the backdrop for beautiful wave-like embroidery in silver and grey. Oversized Overfilled with Hypoallergenic Filling.